Have you lost Excel Password and want to open encrypted Excel files? 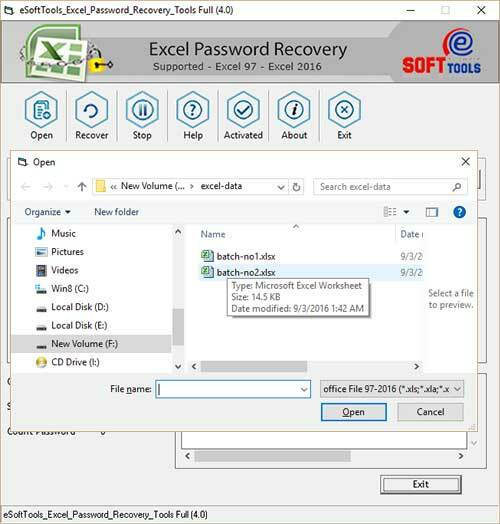 eSoftTools Microsoft Excel Password Remover Software can do very easily and recover lost Excel password open file. Our MS Excel Password Remover tools can smoothly works on password protected MS Excel (XLS & XLSX) Workbook file and deal with multiple password recovery attacks to open and unlock Excel Password. eSoftTools Excel Password Remover tool can easily break excel 2016 password also. Remove Password from XLS & XLSX files. Ease with handling by every user. Demo version of MS Excel Unlocker software show's you first 3 character's of password. Opt an excellent solution to instantly break excel password open file and worksheet also. This tool will helps user who forgot their original excel file password and needs to remove excel open password & worksheet password. Software has inbuilt recovery of excel password algorithm to easily crack and remove excel file password. Make instant action to remove excel worksheet password. Completely recover excel sheet password in seconds and allows to permanently remove excel file password. Our Excel Password Remover Tool supports every version of Excel files including Excel 2013 and 2016. We offers all updates free-of-cost for 1-year's. After this contact with our support staff. Demo version software show's you first 3 character's of password. 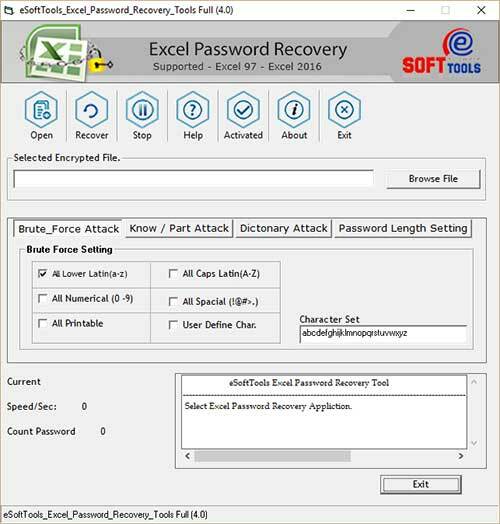 eSofTools Excel Password Remover uses more than recovery concepts to easily crack Excel password. The "Brute Force Attack" searching concept is very reliable solution to create word combination and easily break excel password. "Dictionary Attack" is also a good solution to search excel file password and recover excel password. 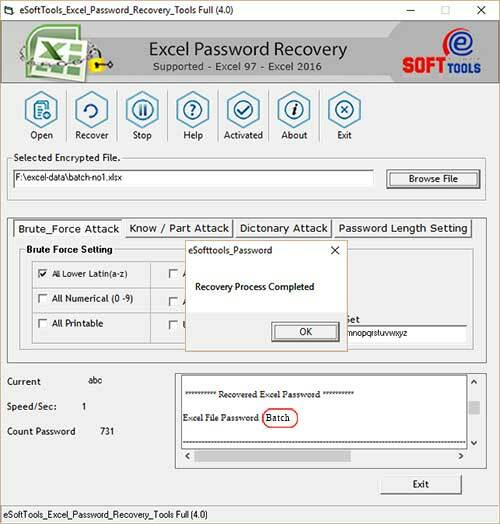 Excel Password Remover Utility handles these scenario and remove Open Excel Password with "Brute Force Attack" and "Dictionary Attack" based technology. User can easy to remove Excel Open Password by stating 2-3 simple mouse clicks. 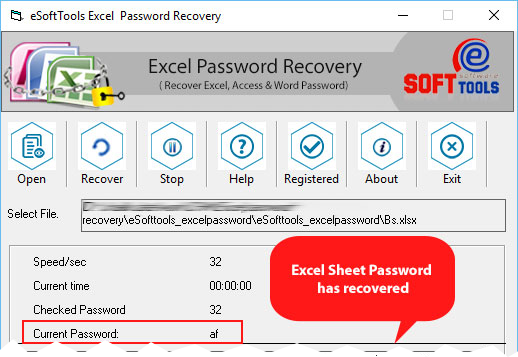 Recovery of Excel Worksheet is now very easy task with eSoftTools Excel Open Password Remover Software. Our Remove Excel Password Utility easily open excel file (xls & xlsx) in seconds and break excel sheet security and gives you the original password of Excel Sheet, Which you can use to open your Excel WorkSheet for editing. Our developers alway's designed software with very smooth process and minimal mouse clicking based tool which users easily access the steps and perform / complete their tasks. Demo version Free Excel password remover software completely works like full version but its only restriction is to show you first 3-character of passwords. Remove Excel File Password Tool supports every version of MS Excel including Excel 2016, 2013, 2010, 2007, 2003 and 2000 files. I know my Password has "UpperCase" & "Numbers" only. How your software deal with conditions? You can set the recovery methods as your condition's with "UpperCase Letter's" and "Numbers" in Character set option. As your selection, software searched password with combination of "UpperCase with Numbers" only and recover your excel file password. I have more than one Worksheet's in my Excel File and only few sheet's has password protected, Is your tool recover excel worksheet password? YES, our software can do this perfectly. You can simple browse your Excel file in software and start the recovery process, Software restore your excel worksheet password and show you. How can i set the maximum character for searching excel password? You can use "Min-Lenght" and "Max-Lenght" option to set the minimum character number and maximum character number for searching excel file password. Is MS Excel Required for this software? YES. Its must because software internaly uses the process of MS Excel. connect with Skype for software query. © Copyright 2016. eSoftTools Software. All right reserved.